Jindie Nails: Santa Claws Collection Swatches and Review! Well, now that Halloween is over- how about moving on to Christmas? Tonight and tomorrow I have some great new Holiday polishes to show you! Tonight I have an awesome collection to share- some of the polishes from Jindie Nails Holiday Collection, Santa Claws! I have Noel, Santa Claws, Silent Night, Just Elfing Around, and Candy Cane to show you all. 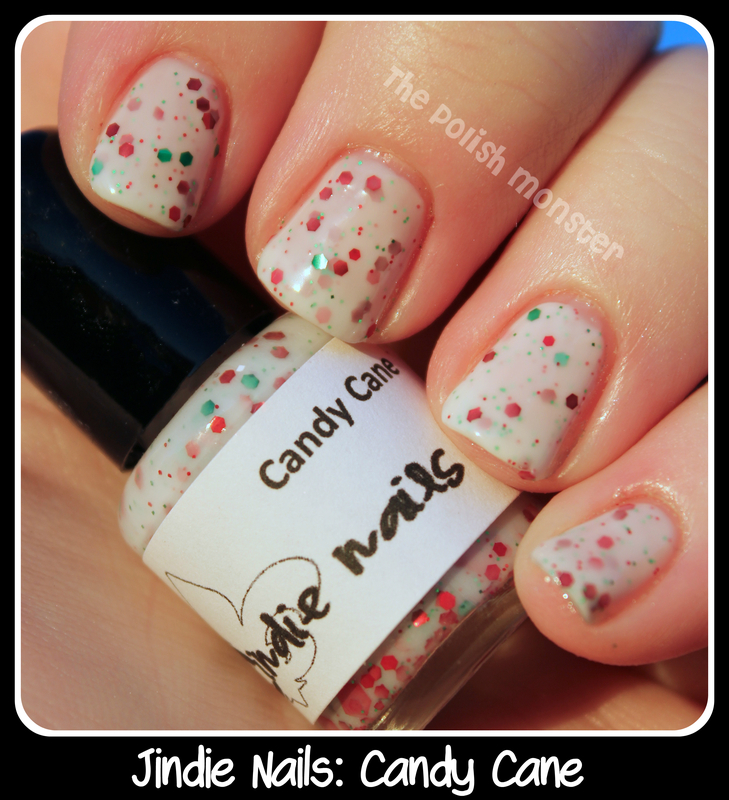 This isn’t the first time I’ve posted about Jindie Nails; you can see swatches here, here, and here! Jennifer, the creator, is a real sweetheart and I really love her fun colors. First up, we have Noel! Noel is an awesome polish filled to the brim with tiny red, white, neon green matte glitter with just a splash of green sparkle. These photos are 3 coats of Noel alone, though 2 coats would be plenty. I had great coverage with 2, I just know that photos tend to magnify tiny exposed areas you may not notice otherwise! Like similar ultra-fine matte glitter polishes, it’s very thick, but it’s also very easy to work with. I didn’t have to worry about cleanup, and the polish went exactly where I wanted to (and stayed there!). Next up, I have Santa Claws! Santa Claws is a mix of white, red, black and green matte square glitters. This is described as looking like Santa’s outfit, and I agree! This one is definitely designed as more of a layering polish- I used 3 coats over OPI’s DS Radiance. Application was easy, and I used a bit of dabbing to get some of the squares exactly where I wanted them. Next is Just Elfing Around! While I really loved a lot of the polishes in this collection, I think this one is my favorite! I love the name, and I love the fun color combinations! Just Elfing Around is a mix of pastel green, white, and cherry glitter, with a bit of silver and lime green holo glitter as well. This is 2 coats of Just Elfing Around over Color Club’s Fly With Me. As expected, I had a lot of trouble fishing out the really large glitters, but I didn’t shake or roll the bottle much before applying. Application was nice and smooth, I dabbed a little to ensure even coverage. Next we have Candy Cane! How gorgeous is this polish, doesn’t it just *look* yummy? Candy Cane is a white jelly polish filled with cherry red matte and metallic glitter, with a tiny bit of metallic green glitter and sparkle sprinkled in. Coverage was good, this is just 2 coats of Candy Cane. The only downside (if it can be considered a downside) was that this was the only polish of that bunch that required a decent amount of cleanup. I find this a bit typical of jelly finishes, but it was a little more prone to flooding than the denser glitter bombs. But it cleaned up quickly and easily and looks beautiful! I love polishes that give you a jelly sandwich look without having to do anything special! And last but not least, we have Silent Night! Silent Night is a stunning midnight blue jelly polish filled with a purple shimmer, various shapes and sizes of silver and blue holo glitters and shreds, along with silver stars and moons. The color on this one is just very very gorgeous. I instantly thought of a nighttime sky, which of course is the idea 🙂 It was slightly more challenging than some of the other polishes in applications- again, same issues as Candy Cane due to being a jelly polish, but nothing bad. I had to fish a little for the larger shapes, but I didn’t have much trouble getting a few moons and stars out! You can follow Jindie Nails on Facebook here for all of the latest news and upcoming collections, and can buy these gorgeous colors here on Etsy. You can also find Jindie Nails on Instagram at @jindienails or at this link here. This entry was posted on November 3, 2012 by The Polish Monster. It was filed under Uncategorized . They looked really pretty and I love Noel and Silent Night~!! Thanks for the detailed post on how the polish is when used. Helps to know since I am not a glitterbomb fan!! I really like them all but my favorite would have to be Silent night. It is absolutely gorgeous and it reminds me of the painting “Starry Night” by Van Gogh.